Photograph courtesy of Brenda and Michael Skinner. 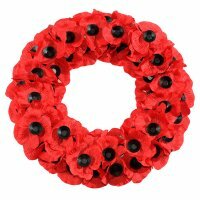 Edward [Eddie] Charles Skinner was the son of Charles and Ellen Skinner of New Wimpole, Cambridgeshire. 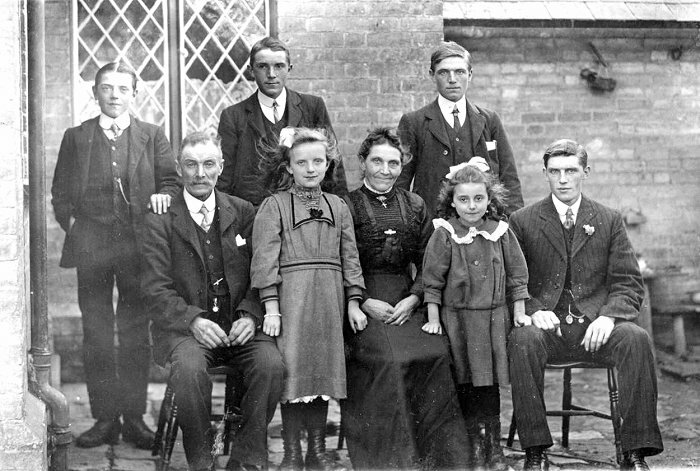 The photograph above shows the Skinner family, photographed at the Wayman's house [68 Cambridge Road] around 1912. Eddie [seated right] was brother to Frank Skinner [standing, right] and Harry Skinner [standing, centre], who are also listed on the Wimpole and Arrington War Memorial. Within four years of this family photograph being taken, three of Charles and Ellen's four sons had been killed in action in France. "A couple of weeks ago, on a beautifully sunny autumn day, we decided to pop over to Wimpole Estate in Cambridgeshire. Within the estate grounds is the Anglican parish church of St Andrews and in the churchyard, very close to the entrance is a family grave that contains the mortal remains of Charles Skinner, his wife Ellen, and two of their grandchildren. 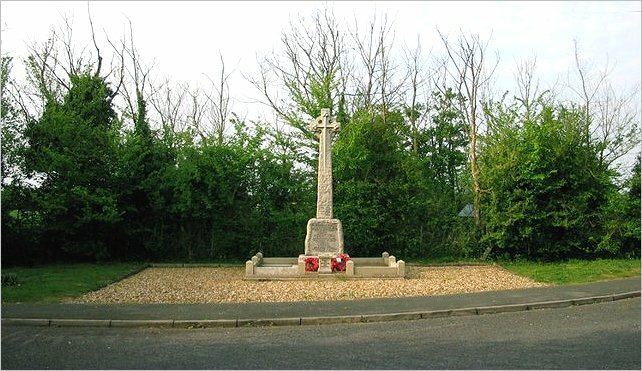 The headstone must have been erected when Charles died in 1926, but the focus is very much on Charles and Ellen’s three sons, all killed in action during the First World War whilst serving with the Suffolk Regiment. I suspect that their names were added at the same time as Charles’ details, a suitable gap left between to accommodate Ellen in due course. Note too, the Suffolk Regiment cap badge at the top of the stone. "13644 Pte Frank Skinner, standing on the right, was the first of Charles and Ellen’s four boys to die. He was killed in action on the 1st July 1916 whilst serving with the 11th Battalion and is buried in Gordon Dump Cemetery, Ovillers La Boiselle. 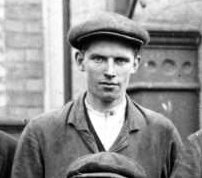 Just over five weeks later on the 9th August 1916, his elder brother, 15628 Pte Edward Skinner was killed in action whilst serving with the 7th Battalion. 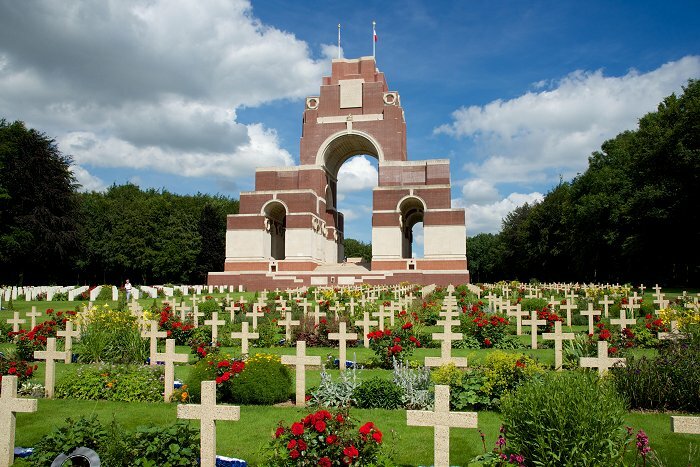 Edward, seated on the right, has no known grave and is commemorated on the Thiepval War Memorial. 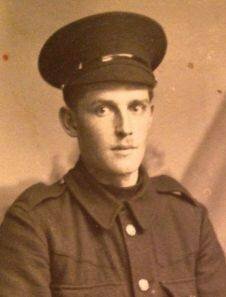 Finally, on the 5th April 1918, 23312 Pte Harry Skinner, also serving with the 7th Battalion, was killed in action. He too has no known grave and is commemorated on the Pozieres War Memorial. 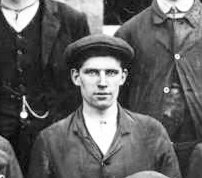 Harry is the man standing in the centre of the photo which dates to about 1912. Thus Charles and Ellen Skinner lost their sons. "The photograph I have used (above) comes from Wimpole Past, a local history and genealogy site for Wimpole in South Cambridgeshire. We’ve been to Wimpole Estate before and I recommend it, particularly now, at this time of year with the leaves changing colour. We were blessed with warmth and bright sunshine but nevertheless, seeing this headstone at any time of the year brings nothing but chills. RIP Frank, Edward and Harry." Reprinted from the British Army Ancestors website. The memorial, designed by Sir Edwin Lutyens, was built between 1928 and 1932 and unveiled by the Prince of Wales, in the presence of the President of France, on 1 August 1932. 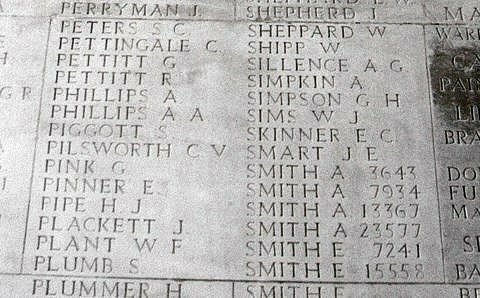 Edward C Skinner is also commemorated (under the badge of the Suffolk Regiment) on the gravestone of his father C E Skinner, in Wimpole Churchyard. Edward Charles Skinner for this page.